On 14 July, NASA’s New Horizons took the closest images of Pluto, the only planet in our solar system unexplored by space probes. The mission to Pluto explored the edge of our solar system and potentially the origin and evolution of the planets around us. New Horizons was launched 19 January, 2006. Pluto is 3 billion miles from Earth and requires 9.5 years to get to. 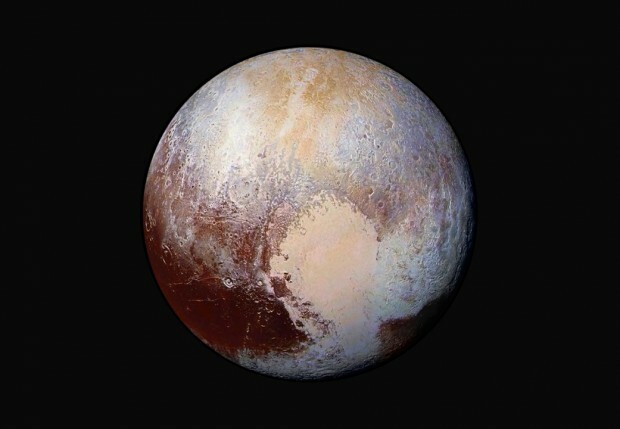 The image above uses enhanced colour images to detect differences in the composition and texture of Pluto’s surface. The image was taken when the spacecraft was 280,000 miles away. Why didn’t we orbit Pluto? The mission was only a flyby mission because in order to get into orbit, New Horizons would have to use 1000 times more fuel than it can carry! New Horizons will also journey deeper into the Kuiper Belt, of which Pluto is one of the largest objects. The Kuiper Belt is thought to be the source of most short-period comets. If we had orbited Pluto, we wouldn’t be able to explore this mysterious, icy part of the universe. The debate on whether Pluto is a planet still continues. Recent discoveries of small planets started the debate. Many consider Pluto a planet because it orbits the Sun. They also argue that it is large enough that its own gravity has pulled it into a spherical shape, however this is sometimes disputed. How did you react to the Pluto flyby? Let us know over Twitter or Facebook! Pssst... Have you followed our Instagram page yet?